Ons is baie opgewonde oor die uitbreiding van die NGK familie en RCJ se Getuienis-vennootskap op hierdie manier. Dit gebeur vanuit die diepgewortelde vertrouensverhoudinge wat oor jare se samewerking opgebou is tussen kerkleiers en sendelinge, asook plaaslike lidmate. Ons vertrou dat veral hierdie aspekte van dienswerk (diakonaat) en getuienis (deur uitreike soos hierdie) in die jare wat kom van krag tot krag sal groei … en dit is ook sentraal deel van ons werk as sendelinge om dit uit te bou. In Junie vanjaar word ‘n spesiale nuwe organisasie genaamd “Mission Africa” ook DV hier in Japan (deur die RCJ) op die been gebring, o.a. spesifiek hiervoor. Ek sien uit om in persoon meer hieroor te kom vertel in gemeentes wanneer ons vir 3 maande (Julie-Sept) in SA sal wees vir terugvoer en verdere bekendstelling van Missie Japan se werk. From elementary school onward, Toru Ashida joined his church whenever possible in welcoming North American summer missions teams to Tokyo. As the years passed, he knew he wanted to do something similar. This summer he had just that opportunity when he became part of the Reformed Church in Japan’s (RCJ) first overseas short-term missions team. Christian Reformed World Missions (CRWM) missionary Ken Lee has encouraged the RCJ to send a team overseas for some time. In fact, that’s partly why he and Rev. Ashida, Toru’s father, have hosted so many North American volunteer teams. Until recently, however, many RCJ leaders struggled to see how such efforts could be possible. Ken and Rev. Ashida, however, continued to stress the RCJ’s need to personally experience missions in another place. Soon many RCJ leaders agreed. The RCJ started looking into mission field possibilities, wanting to connect with a place in which their international partners in Japan already worked. The church finally settled on Cambodia and South Africa. RCJ leaders wanted to send out a team in 2011, but Japan’s devastating earthquake and tsunami delayed their plans until this year. In August, Ken, four adults, and six young adults went to serve on the RCJ’s behalf in South Africa. The team spent much of their time at an orphanage that the RCJ supports for children with HIV and AIDS. The members played with the orphans, worshipped at local churches, visited Christian schools and orphanages, passed out Bibles, and helped paint a building. These goals were certainly met. One team member, a young adult, testified afterwards on understanding the importance of personally participating in the Great Commission. 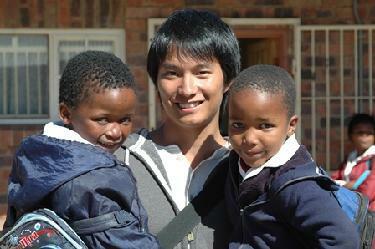 Another volunteer shared that she would like to return to South Africa as a missionary someday. Meanwhile, a pastor who had doubted whether the trip was useful came back celebrating how he had seen God at work. “This was a very special summer for [my wife] Jeannie and I,” says Ken. “We had been praying for [the] day when the RCJ [would] send out a mission team overseas.” The RCJ will now build upon the relationships it has begun by sending teams to Cambodia and South Africa in alternating years.